1. Hinduism, Buddhism. action, seen as bringing upon oneself inevitable results, good or bad, either in this life or in a reincarnation: in Hinduism one of the means of reaching Brahman.Compare bhakti def. 1, jnana. is full of good karma. From three people who joined to save, according to the website, "one little cat", Carma has grown into a registered charity with five chapters in New Brunswick and Nova Scotia. Carma"s main goal is to "humanely reduce" the feral population through TNR, by placing non-ferals into homes, and assisting caregivers with the expense of providing food and shelter. Its long term goals are education and lobbying. Carma is run totally by volunteers. It receives no corporate sponsorship, nor is it grant funded, although it recently received a modest grant from PetSmart. Many of the donations are also provided by the volunteers, and each chapter hosts its own fundraisers and appeals. The needs are the same as most anywhere: food donations, foster homes, volunteers. Chapters hold raffles, man booths at local markets, and provide food and shelters to colony caretakers. Although the chapters work independently, they do come together for an annual meeting and stay in touch via email throughout the year, sharing fundraising ideas and other strategies. The Board meets via Skype every two months. "There"s quite a bit of distance between the chapters," said Carma president, Madi Legere. Legere shares her home with eleven cats-five permanent residents and five fosters. Legere"s involvement with Carma began in the fall of 2006 when she read an article about Corinne Peveling, who was already involved with caring for feral cats. Those two, along with Leanne Carter, did much of the groundwork of laying the foundation for Carma. The first chapter started in Moncton, New Brunswick. "Five people came to the first meeting," Legere recalled. "Now we have about one hundred volunteers among the five chapters." Carma has an impressive TNR record which shows how chipping away at a problem little by little can make a huge difference. Legere estimates that 2,600-2,700 cats have been altered. The chapters are at different points in the process. The Moncton chapter alone will hit its thousandth TNR this year. This has been accomplished by a dedicated group of seven two-person teams trapping within a thirty-mile radius-quite a large area, Legere noted. "The Fredericton chapter does most of their altering at clinics held at various vet facilities, usually once a month through the summer," said Legere. "They do 60-70 cats at a time this way, but the clinic is held wherever there are vets willing to house it. They do almost all their trapping in the two days preceding each clinic. The rest of us do TNR several times a week all summer, taking the cats by ones and twos and threes to whichever vets have time to do them. Moncton and Charlotte County hope to do at least one clinic this year." The St. John"s chapter is in its first year of TNR. "They have a very dedicated young vet tech who has taken the lead there," Legere said. "We"d love to get more chapters started, of course." There are so many stories that stand out for Legere. A notable one is the story of Destiny. "Tiny has deformed front legs; they fold inward at the knees. There"s a lot of inbreeding in the feral colonies. 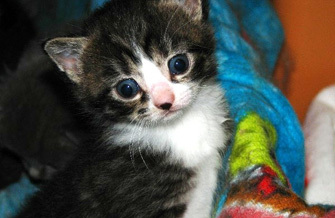 We found Tiny and her brother in a shed, fostered them, and found them both homes. Again, after a year, Tiny was returned due to allergies. When she was returned we found she had been overfed, not a good situation considering her legs. We placed her with a foster caretaker who fell in love with her and kept her. Tiny has such a personality!" "Timmy is a tough old barn cat. He"s a yellow tiger cat who showed up at a house in the country; he was probably dumped. The residents began feeding him, so of course he stuck around. Then the couple"s niece and her mother moved in to care for the couple and continued feeding Timmy. By this time, the lady cats had gotten the news, and Timmy fathered a few litters before they called us. We"ve gotten most of them altered now, including Timmy." "We can"t keep up. We get calls all the time. Thankfully, we get a lot of donated food. 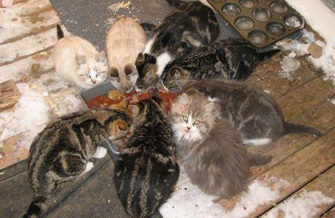 This is a huge help since a lot of people who feed cats can"t really afford to. I remember one gentleman whose unemployment ran out, yet he shared his can of beans with the cats." Recently, the local weather network did a story on Carma interviewing Madi and the local director. "But the real star was Timmy. His caretaker scratched him with a corn broom-he loved that!" Legere said. "Timmy"s life has really come full circle." "There are so many abandoned ones. That"s where we come in," Legere continued. "It"s been a wild ride." 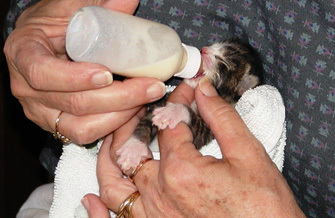 Carma"s website describes TNR as life-affirming. If you want to see a life-affirming transformation, you must go to the website and visit the Moncton chapter. There you will see a heart-wrenching "before" photo of Faith. Click on her photo to see her story-and her amazing transformation. In Buddhism, if you reap what you sow, then surely the volunteers of Carma have reached Nirvana on earth. Cat Rescue Maritimes does it all for the cats in need! *Click here for more information, including their chapters in Moncton, Halifax, Fredericton, Charlotte County & Saint John. *To volunteer or make an inkind donation, please click here to contact Carma via their webform.